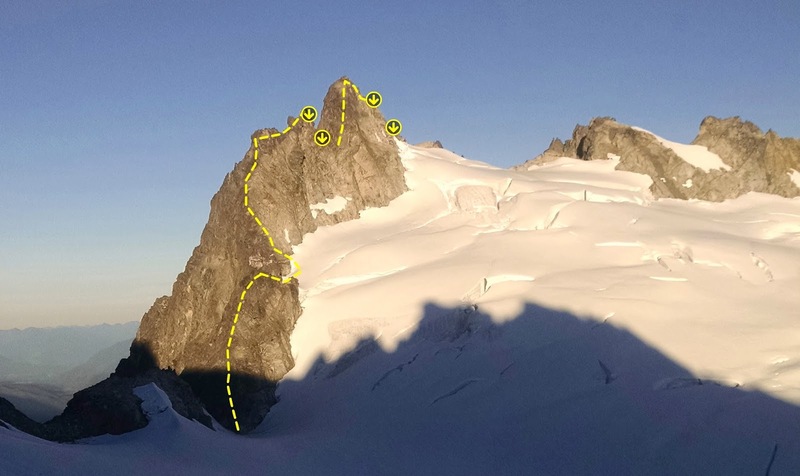 EAST RIDGE: This sharp crest leads from the col E of Dorado needle toward the summit. First ascent by Joan and Joe Firey, Hans Hoesli, Dave Knudson and Peter Renz on July 4, 1971. 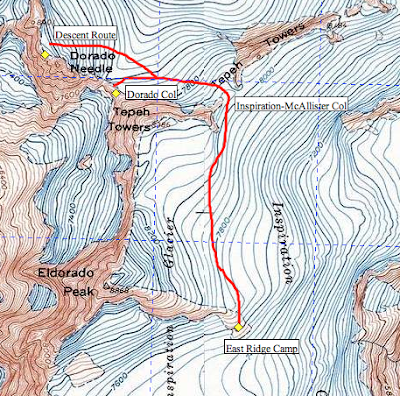 The route involves class 3-5, sound, granitic rock. Ascend the ridge to the eastern subsummit, then rappel into the notch beyond for completion to the summit. Rating: 5.5. Time 4 hours. 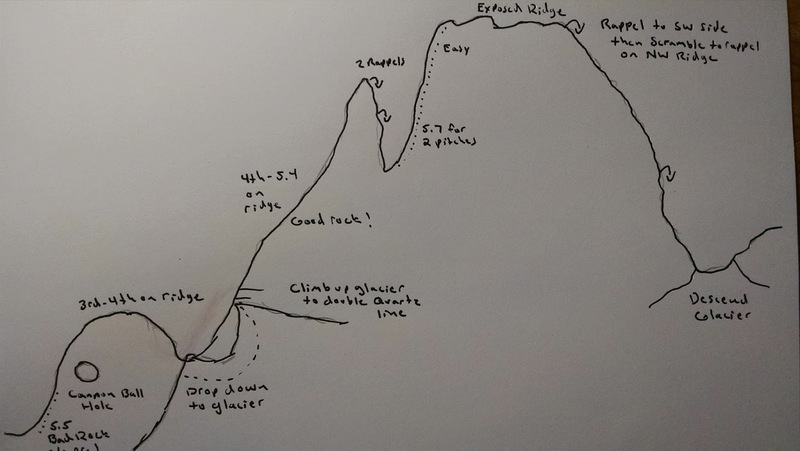 On an ascent of the route in 2016, we found this description to be... less than adequate. 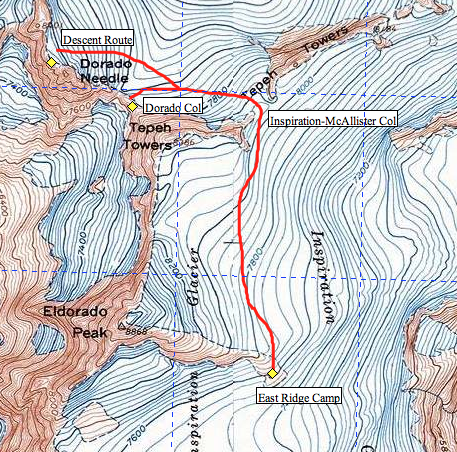 The route clocks in at about 5.7 and most parties will take eight to twelve hours from the Eldorado East Ridge camp (where there's a toilet) to the summit of Dorado and back. 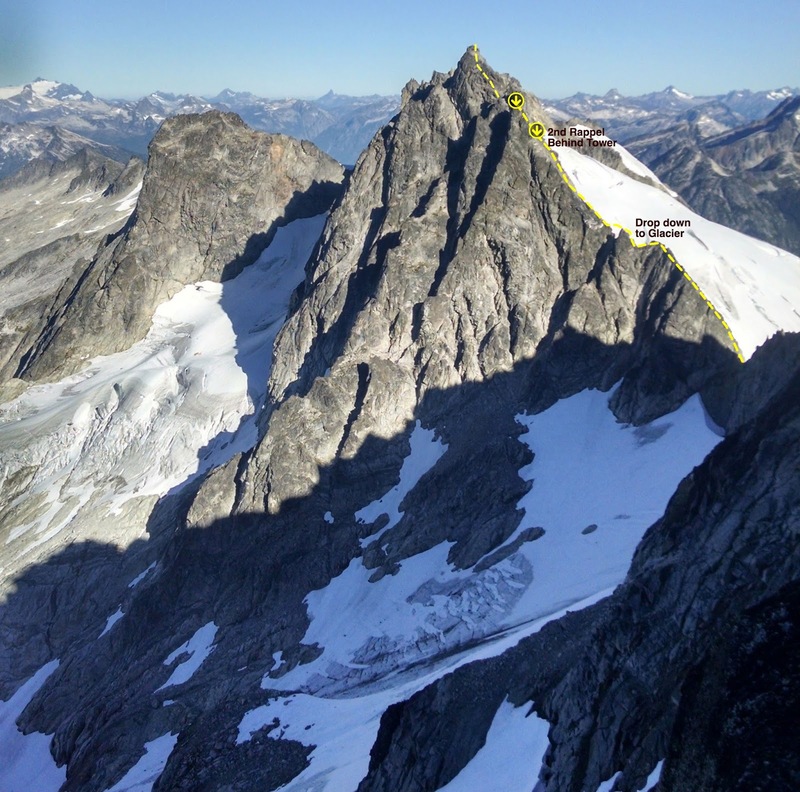 Additionally, the route presents many different alpine problems that make it an interesting and fun route to climb! 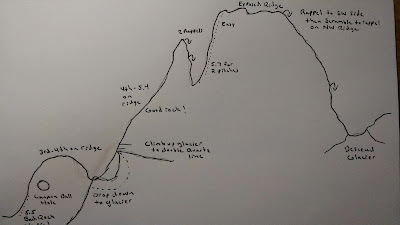 Approach: From the camp at the base of the east ridge of Eldorado Peak (see Selected Climbs in the Cascades, Volume I), traverse the Inspiration Glacier to the north avoiding crevasses until you reach the Inspriation-McAllister Col. This is a good time to take a picture of the NW Ridge of Dorado Needle and the glacier below. On the descent you will not be able to see all the options and an early photo that you can reference later will help with your return trip. Drop down the glacier until you reach the Dorado Needle Col.
Route: From the Dorado Needle Col, climb one very loose, nearly unprotectable 5.5 pitch, to a stance. Approximately 100-feet up from the Col there is a large horn that had a sling on it when I climbed it. This is the best anchor if you start from the Col. There is protection, but it is thin. Everything that you might consider for pro needs to be checked to ensure that it is attached to the mountain. An alternative is to cross the moat to the right of the Col and climb straight up underneath a cannonball hole in the mountain. While we didn't go this way, it is reportedly better climbing. However, you may have to deal with a very dangerous moat. It should also be noted that the cannonball hole is hard to see on the approach. 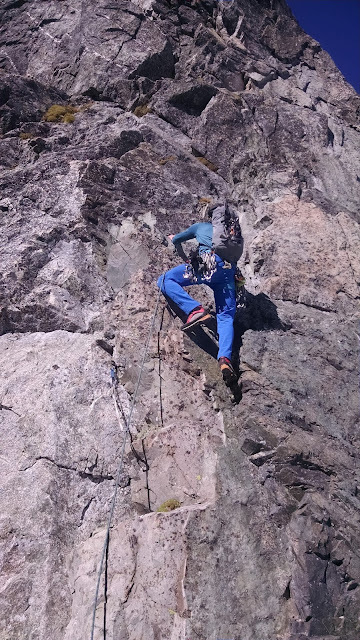 At the top of the first pitch, scramble up toward the ridge crest on better rock. Continue for several rope lengths along or just below the ridge. The climbing here is anywhere from third class to easy fifth class. All the ridge climbing throughout the entire route is either on the ridge or below it on the right-hand side. Eventually, you will come to a notch. Down-climb third and fourth class terrain to a spot where the glacier touches the notch. From here, cross the glacier to the base of the continuation of the east ridge. The best place to access the ridge is at a ledge with two quartzite lines. Beware of the moat here as it is bottomless. Many parties may choose to skip the loose bottom of the east ridge and simply access the mountain after this notch. The rock is significantly better from here on out. After you access the rock, continue up for several rope lengths on terrain that ranges from third to low-fifth class to the top of a tower. Make two short rappels into the notch between the ridge and the summit pyramid. Working up 5.7 Terrain toward the Summit. Climb good rock for another two pitches. This terrain looks harder than it is as you approach it. The climbing is never harder than 5.7. Climb one to two more easy pitches to the summit of the mountain. Descent: This descent can be easy, or it can turn into a nightmare. Stay awake and pay attention. There is a lot of tat on this mountain that leads you to difficult moat crossings. From the summit, ignore the tat around the summit block and continue down the ridge toward the Northwest Ridge. Eventually you will come to a block that is inconveniently wrapped with tat. It's inconvenient because you will have to climb over to the other side to rig it for a rappel. One way to tell that you're in the right place is that you can see that you'll be about five to ten feet above a stance when you rig it. There is a lot of tat on the north side of the mountain. If the moats are not too difficult, you might be able to use some of these. But if the moats look like they'll be a problem, then you shouldn't rap that way. We rapped easily down the southwest side to a stance that is exactly 30 meters (100-feet) below. From there we scrambled on easy ledges back to the NW Ridge and to an easy rap that took us to a moatless notch at the base of the NW Ridge. From the base of the ridge, you will have to find a way down through steep crevasses in order to make your way back to the McAllister-Inspiration Col. In 2016, we found a good path down on the skier's right side of the glacier. Dorado Needle is an excellent climb. This is an adventure climb in the purest sense. The peak is remote, big and incredibly cool. An ascent of Dorado Needle is an ascent of something at the very heart of the North Cascades!